The fairways were baked, running hard and fast. Plumes of dust rose in the air with each mashie shot. (Yes Virginia, there is dust in Seattle.) 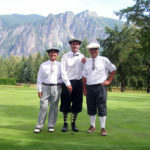 With a recent record of 56 consecutive days without rain, the sites of the 3rd Annual Pacific Northwest Hickory Championship, played at Snoqualmie Falls Golf Course and Mount Si Golf Course (est. 1927), offered unfamiliar tests for the Northwest hickory players. As it was in the ‘20s, the roughs were rough, and the fairways rougher. But the hard grounds also had its advantages as 270 yard drives were not uncommon for the long hitters. Click Here for a PDF file of Martin Pool’s write-up with photos. Day 1 at the par 71 Snoqualmie Falls GC, played at 5649 yards, saw some very fine scores with six players at 75 gross or better: Scott Miller 71, reigning U. S. Hickory Senior Champion Jim von Lossow 72, John Lavendoski 73, Dave Paremski 74, Jeff Olsen 75, and Kit Ledbetter 75. Day 2 was played at the par 72 Mount Si GC at 6008 yards. In a stirring finish, Jeff Olsen of Shoreline, Washington came from behind to tie Scott Miller of Issaquah, Washington in regulation, both finishing the two rounds with a score of 147. Olsen and Miller went to a playoff and in an epic battle, Olsen prevailed after going five extra holes. It was yet another heart break for Miller as he has finished runner-up each year of this event. John Lavendoski of Bainbridge Island took the low net honors in the Open Division. In the Senior Division, Kit Ledbetter distanced himself from the field backing up his fine round on the first day with another on the second with a two day score of 149. John Quickstad took the low net honors. In the Super Senior Division, Larry Hardy followed his victory in the Arizona Hickory Classic to win yet another title. John Wise won low net. In the Women’s Division, Paula Anderson shot 97-89 to come from behind to defeat Roberta Robbins, the reigning U.S. Women’s Hickory Champion. Before the second round got under way, we received the sad news of the passing of our dear friend Jack Wilson. Jack was passionate about hickory golf, as a collector and as a player. He was one of the founders of the Northwest Hickory Players, and few in the world could match his knowledge and passion for hickory clubs. A perpetual trophy for the Pacific Northwest Hickory Championship will be named in his honor. We will all miss him very much. To read more about Jack, see Rob Birman’s tribute to Jack: Remembering Jack Wilson.